I King Gottwald Peter under duty to obtain partnership for stabilization of The Imperium of Diamond's federal government as self-recognized peaceful state under own Constitution Principles recognized by The UN Charter and UN General Assembly Convention's, all case of natural policies of states and government's in relation of diplomacy building between states with own national territories or people with origin in territories of terra nullius, the Independent States, I want invite Your excellent countries and states, all NAM nation's for our peaceful cooperation and cooperative expansion of Your State Partner Relation's in our mutual interest's with principles of The NAM Conference Bangdui Code, and therefore I am in interest of friendship between our nation's with our cooperation for mutual development and diplomacy building, I provide opportunity for our cooperative development and profit of our nation's. Dear Excellence Ladies and Gentlemen's, I am true pleased, Your ability protect a true. The ID's government, We are respect UN Charter, and we are use our policy strategies under rules of UN Charter in process of Peaceful Dispute Settlement, our state is available for diplomacy building and international active cooperation between nation's, supranational organization's, and build partner diplomacies with multilateral relation's between the states, our legal statute in International Law give us equal position of peaceful nation and recognized government under International legal standard's. Our country origin in year 1998, bud our problem have drastic catastrophe consequence in terrorist blockade on our right to life in our country, during crime pf slavery, neo-colonization and crime-imperialism, with blockade to activate peaceful settlement, International Justice activation and defense by International Law which currently have drastic violation with global effect's created from crime enemy of our state opposition, and therefore in legality of our state and government, no any conflict is origin on our side. 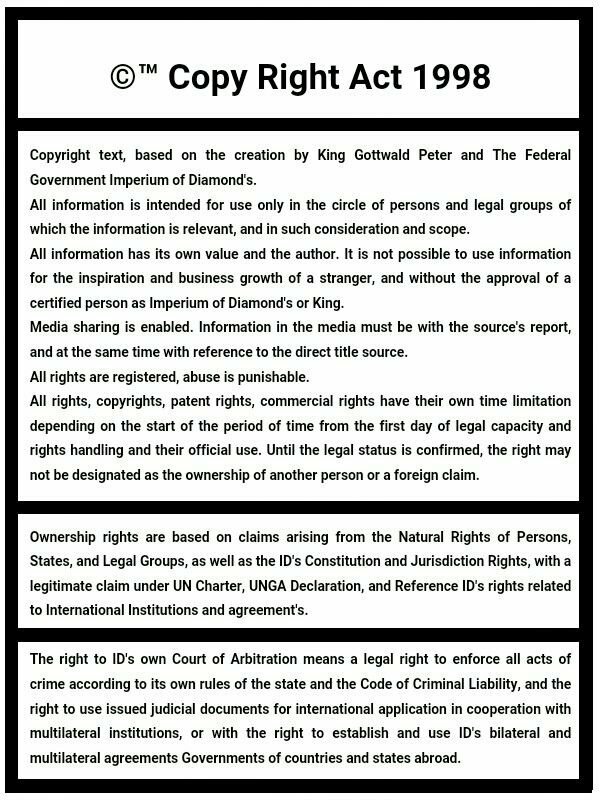 The Imperium of Diamond's government is statute which haven't own rise in arm's, violence and aggression, no war interest or plan on violation of International Law and integrity of any state. The Imperium of Diamond's is subject which rise in the law recognized by declaration's of Your government's, under principles of UN Charter and UNGA Covenant's, we are together use the law and rule which You are provide to us by Your State Representation and we are want join only for peace and for partnership. Our legality is recognized by international law, partner support from majority of government's around the world and denunciation between mean number of supranational economic, security and policy organization's, bud active neo-colonization with neo-extraterritorial and imperialist blockade on our state existence with forced decentralization without legal approval, the active crime of European Terrorist Alliance of states in International level between nation's, with own factor of purpose on abuse ETA National Mandates in Supranational prganization's including the UN Security Council, for our censure, dis-manipulation without process under the codes of United Nation's and Internationally recognized principles, we are therefore want obtain Your support for partnership in statute protection, and stabilization of The ID's Government function, with opportunity for our strategical international co-organization, and allow to NAM increasement of one new member in name of The Imperium of Diamond's. I am pleased, for our mutual ratification of government's between our policies, and therefore stabilization of ID's statute with open ability to connect friend development with Your government's of countries, nation's and regional organization's. Today day's we are must face agains't criminal bureaucracy controlled by the monopoly and neo-colonization from European Terrorist States, together with their practice to abuse their national people in Supranational Mandates to prevent establishment of justice, and for protection of silence agains't our people, state existence and for decentralization of our nation, every day we are observe the non-conventional blockades in International organization's, and therefore we are need obtain our International integration opportunity according principles of natural policy practice, activation of our diplomacy relation's according one self interest of one state and government in bilateral relation multiple between every legal and peaceful, in law respectable government countries in the world, as preliminary before recognization in the United Nation's where every important data and UN legal mechanism's is blockade by the monopoly, bureaucracy and data falsification and recruitment under clearance by the member states of European Terrorist Organization. The Imperium of Diamond's is legal government recognized by International Law declared in all states around the world, and here not exist any purpose of rule, interest or claim for legalization of our blockade, dis-respect and dis-equality. Therefore I am pleased, for Your response of true Man with pride for own pride in trust for law, and therefore disrespect UN bureaucracy monopoly for non-conventional monopoly, the risk on internal UN veto by UNSC, and blockades, no is made resolution to prohibit ID's state development, we are also haven't any dispute on our existence by International Law, no crime connection, and therefore our opportunity is cooperate without limit. Our countries can stand together in partnership without risk of any legalized sanction or opposition right, We can connect our trades, develop partnership between our bank's, provisory re-connect between post offices, we are together build our partnership in security, we are also centralize in ID's DONEABT territories where Your business companies can in deficit's of our management establish their new business branch and support building my country as Your new Governmental partner in International level relation. Under standard practice of mean world central bureaucracy and non-responsible blockades originated only in interest of competitive monopoly, for last ten's of year's, when UNSC abuse own position of Policy Power in UN Charter Rule of Law, as abuse for their crime interest in colonialism and persecution, blockade of "Peaceful State Development", than therefore all nation's can together use the situation of bureaucratic persecution as "Important Facta" on need UNSC re-structuralization, and to today 21 year's of UNSC obstruction during protection of terrorist organization active in and developed for, worse crimes than World War II., it is true proof on urgent importance for start transformation of UNSC power's and right's which provide opportunity on better security administration, together with power of justice where therefore never in the world exist permanent risk or dominance in crime agains't any one country on the world. If UNSC haven't interest responsible protect function of UN Charter in relation to the UN Trust States, than therefore we stable haven't a change, and our right for active cooperation in business or state development haven't progress, and therefore in interest on our state relation's, we need cooperate without the ID's membership in UN. Partnership between states without UN membership is international standard, when I am also stable interested for active peace partnership between nation's and use own progress for better opportunity in building own membership in the United Nation's organization supported by all member states of UN. The Vatican, Pakistan, Palestine, South Sudan, states which is long year's without UN membership, and stable developed nation's in International Law, respected justice, respected diplomacy and agreement's, open development of economy. Many of states of NAM also long year's haven't membership in UN, and nothing is change on their state right existence as equal in international position, the Imperium of Diamond's is recognized between government's responsible in a law, only criminal entities have complication with us. Dear Ladies and Gentleman's, Excellent Representatives of States and Nation's, I King Gottwald want connect with all states of Non-Aligned Movement, and if The NAM states support ratification of ID's government as subject with policy existence, we are together can openly develop our partnership in every meaning, and I am also glad for our cooperation in purpose of ID's International Trusteeship Council which support ID's State Stabilization during our partnership on purpose of Trusteeship International Assembly of States in cooperative trades development, building connection between our states under our mutual interest's. I am please all states of The Non-Aligmed Movement, please for support establishment of the UN Agency for ID's Stabilization and Diplomacy Connection between Supranational Societies during today time of criminal colonization and terrorist blockade, The Specialized Agency according The United Nation's Charter Article 59 & 55. The Charter of United Nation's, Chapter IX. The UN Agency is Important represent as Address for Communication in International relation between the states and people, the ID's Provisory Consulate, because the United Nation's have own self-declared rule in global validity and for such principle of protection, it is important in disaster prevention to support our opportunity for financial connection and together friendship activity, because terrorist states build permanent blockades agains't our right of international connection, and also prohibition for right to contact us, which create effect of generation durable time of civilization disaster and catastrophe. Agency is process of ID's Activation of Government Authority, and agency can confirm dis-importance in continue of European terrorist blockade on my liberty, no any UN claim can be established for blockade on ID's state development, because blockade in crime is activated for purpose to blockade a function of my government administration and this is high level crime in policy purpose, when also UNSC permanent mandates is not given for crime of terrorist blockade agains't legality of peaceful nation under violence from terrorist alliance in the same crime horizon as the World War II mean belligerent parties. The International Trusteeship Council, is principle of standardized policy mechanism in related function of UN Trusteeship Council, which can immediately protect the right of people and nation's, apply in all term's of The UN Charter and UN Rule of Law, together with dynamically developed partner relation between our states all across the world. The International Trusteeship Council is in base established on International partnership between the states, because the ID's current opposition in form of International Criminal Monopoly need therefore responsible International protection, and therefore we true Welcome all states in the world, when we are together unite as one party than our global unity of more than 150 states around the world is permanent power of dominance agains't any of European Terrorist Partner, and our policy interest's, trades and security partnership can openly increase. The International Trusteeship Council is centralized for building the partnership between International Organization's, The Bank's, Conglomeration's and Commercial Companies, legal people around the world, and meanly with stable maintaince of peaceful relation and partnership between every government country around the globe. Our interest of government is urgent stabilization, and we are know, strategical is start immediately, without question on control-ship by the European Terrorist Opposition, because danger in sume of time have drastic dominance competition agains't a risk of danger in one step for office activation. In standard purpose on decentralized government institution which need build first connected center's during criminal oppression, The Non-Governmental Organization as Provisory Administration for ID's International re-connection between world society, and support for active integration in the International system. The INGO obtain sponsorship from public area, and also under investment from the commercial institution's which the NGO activate. The INGO is important for Human Right Defense, Provide Human Health Care and Insurgency with Sanitation, Advocacy before criminal judicial and extraterritorial prosecution's. The INGO is standard institution active under the rule of states and their jurisdiction, no any risk on International Security or Integrity of any one legal state. We are also welcome opportunity on Associated Consolidation of Non-Governmental Organization's, as one coordinated office which can therefore much better and effective organize partnership in global level. The ID's Consulate activation between our countries is one of most important question on the states development and open responsible process of peace development between nation's, meanly blockade opportunity on growth dis-tolerance between countries or threat with a consequence on mutual war's or criminal provocation's. I am true Thankful for Your country, in opportunity activate the Consulate under the purpose of Vienna Consular treaty, with activation of the Consulate Servicer's from Your own national people until ID's available national consolidation of population and state. Until time when ID's government haven't stabilized the people and state, Your government therefore too needn't build the consulate in my country, bud therefore, in our mutual profit and success ability, and than Your government open the Your Consulate dually i function as one Consulate with The ID's government consulate in Your country, where we have ability in urgent each time establish connection between us, and meanly we are together can intensive build trades, businesses, development project's, policy strategies, security partnership. Our Dual Consulate can have function as Office for our mutual affair building, when therefore our national connection rise much faster, under interest's and profit success of our countries. We are also provide more advanced number of opportunities how our government's can together bilaterally and multilaterally unite in one partnership, The ID's Agriculture Development Project of Global Cooperation, is the project which can support Your governmental development in agriculture industry and expand Your state in strategical geography region which strength Your state export of national production. The project have strategical principle in current conflict between ID's and crimes of European Terrorist Organization, because the blockade agains't innocent and no danger-full agriculture partnership in International Level, is process of crime without morality, without social respect ability, and proof on terrorist states radicalization interest of crime agains't all world order's without respect on universal purpose of human being. Our mean importance is connect on Trade Development Management in International Transaction System, which provide us opportunity of cooperative development in International Management Level of Trade between foreign business companies, by contracting of companies and establishment of their market related to the building in our country ID's DONEABT together with an Internationally Partner Companies exchange and development process which in system of organized contract's create effect of profit for all contracting member's, which build their new factories and business center's in our country. Today we are have registered application of membership between more than 100 supranational organization's for world policy, security, commodity trade, technic normalization, state law in responsible limitation also with security and peace observation, and therefore on our state development during international partnership is not create effect of risk, danger or threaten agains't justice or safety of any party in our state, between contracted parties and on International level. We are also provide strategical opportunity for business development inside Your country, as project which under Your own national development strategies and during Your national Authorities observation, rapidly strength economy in Your country. The ID's Global Bank Business Cooperation is contract in term's between Your state commercial bank's as Private and Trade Administrator's of Fund under Cheque for 1,000,000,000,000 € in ID's Currency (Diamond), as finance given in purpose of ID's Consumery and Investment Fund established for ID's annual consumption of important and strategical development product's or service from Your country, during partner management of Your state strategical trades in development and building of Your national economy. Your state increase 1,000,000,000,000 € between period of 1 year, in relation of Your state Export, and therefore Your business companies of state is faster developed under Your Government administration. Today, the ID's DONEABT have registered development plan's as Multi Economy Properties which have true stronger value than 100,000,000,000,000 €, and therefore we are can immediately guarantee and preliminary pay by the Cheque Drawn value for deposit. We are first stabilize our financial authority, with development industries, and therefore the process of currency stabilization is permanent. We Invite Your Bank's for Partnership in activation of The ID's Global Bank Alliance for International Trade of Federation, and we are therefore invite all Bank's around the World, for our consolidated office of new Joint-Venture Banking institution, where Your State Banking Institution's have opportunity directly connect with our ID's State Trade Offices, and agree on development of partnership between our countries in Bilateral and Multilateral Level, together with process of Your Bank's Commercial Interest's, we are is glad for Your Bank's in activation of partnership, and also partner conference with Your Central Bank of Government in strategy to agree on a trades between our nation's. The ID's IQ Partner Council is department activated for cooperation with all Private Bank's from all states around the world, under purpose of rule, asID's State De Facto Administration Council for International Partner logistic development and activation of new trades and businesses inside ID's country, and cooperative across the world, under purpose of direct administration of ID's State Trade by the Commercial Service of Management Administration from Your State Bank Institution's, in world commercial universality known process as The Private Bank Office, Family Bank Office, bud The Governmental Office level, as process on activity in ID's Authority representation under de facto principles. All Private Bank's across the World is Welcome and We are Welcome Your support for our partnership in development and building. We are Welcome Your Business People, our strategy is building The ID's Business Assembly as De Facto National Parliamentary Body of open democracy, the Assembly is activated in time of federal disaster, Catastrophe (dis-function of Cadastral office), the Assembly represent rule of democracy in Trade of State Stabilization building under rule which allow partnership between the Trader's together associate in every circumstance, the Assembly is system of Parliamentary cooperation which is open for cooperation in Global level and provide opportunity immediately start global marketing in value of 1,000,000,000,000€ and more, activate new business branches in country of ID's Government, and provide all guarantee for all member trader's in their justified and equal development without any blockade, dis-justice, or discrimination. If our national trader's unite and together support building businesses in our countries, than therefore our countries can stand as Good Trade Partner's. During time when in our country is not available activate any trade movement, as effect on terrorist blockade and criminal oppression, The ID's Manager Office (Administration Agreement) is strategic document which can growth up Annual GDP of Your country in values of 100,000,000,000 € every month, 1,000,000,000,000 € per year, by activation of the ID's Business Companies from International Commercial Source and cooperation between Investment Agencies, Bank's, Service Companies and Trade Institution's. Our today time, we are invite All Business People and Companies around the world, under our regulatory capacity, available interest of development and in capacity under geographic protection of ID's State national competition stabilization in need's for prevention of foreign monopoly dominance and our dependence, in a start under our importance for urgent progress, we are invite The Most Business People and Companies in The World, documented act is activated for partnership and cooperation in International network of today world active business people, with centralization process of market increasement for building of new ID's Factories of our international trade partner's. One of our strategy related on the Dis-Function of Cadastral Office as purpose determined in the Code of The ID's Trade Assembly, also in next interest of our state international partnership in structures of Electro Technology Industries, we are represent the strategy of The ID's Federal Electronic Consortium as business form of open Joint-Venture for every Electro Technic company around the world, and the effect create a process of the activation of The ID's Artificial Intelligence system for administration of ID's Office, with ability to build the civilization of state. The commercial partnership between Electro Technology Companies is standard purpose on state development in today time of 21st century. Your Business Companies connected in the Electro Technology industry have opportunity open their new business branch and connect on organized businesses and trades in ID's country, our partnership is peaceful and open for legal development. Our current opportunity for Administration of Financial Authority is under criminal blockade, and therefore we are develop our partnership between states in the world, for contracted cooperation between The Central Bank's of States, in similar relation on the International Trusteeship Council, for cooperative administration of the ID's National Currency DMD & IDMD, together audit and statutory institution, which allow us responsible and in International Policy Standard's, use the finance of our state and secure activate our open trades between countries, contract trader's and start importing development material's into our country. We are Welcome Your interest in support for administration of the ID's currency and Financial Authority, our step for progress in financial control is one of most important purpose for naturality of state development and government stabilization, civilization building with own civilized source under responsible regulation management. Today time, our Responsible Regulation Management can by effective only in opportunity to activate the Cheque Book's of Cheque Acount's, where registered people can exchange their finance and connect the trader's of The ID's Country, as corporate network of trader's under ID's Finances, and our mean importance is obtain opportunity connect the Bank's in foreign country for exchange of financial values under the Cheques, and therefore our First interest is connect the Banking System under purpose of TELEX exchange between Bank's, also available according the UN General Assembly Convention's for traditional exchange of financial values between states financial authorities. Until time when we are haven't ability use our own national finance, as effect on terrorist blockades, we are need therefore activate provisory financial system based on International Ratification of Diamond Price, active currency as The ID's Diamond Provisory Currency, in case of our current decentralization, we are can start production of Synthetic Diamond's as Internationally Reserve payment under ID's Cheques with share of Diamond's Deposit, and therefore dually guarantee for our trade establishment in responsible function. The Activation of The ID's Diamond Provisory Currency is available build by short period activation of small commercial firm's in foreign countries, where is possible contract firm's or obtain employment for function of corporate consortium which can simulate the ID's Diamond Provisory Currency administration authority, meanly by activation of commercial contract between the Enterprise Companies. The Provisory Diamond Currency can activate values of 100,000,000++ €'s, the value which is available use for activation new international network of Offshore Firm's as International Business Network of The ID's Business Companies and Joint-Ventures in partnership with Your Commercial Companies of Your state, the network which can under commercial management distribute to the ID's country a source and intelligence of first development, in level's of the First Development Infrastructure as Small & Medium Enterprises or Manufacture Industries of metallurgy, transport production, primary electro component's, water source, agriculture plant's, hygiene industries and facilities, mining, development material's and construction, farmaceutic's, education, small service, small industries and with duty for the government administration with small Private Protection need's. The Diamond Currency is process of payment which have standard purpose in internationally active commodity use, and the right for business development under business currency as valuable exchange haven't problem in International Law or Internationally standard practices. In process of Diamond Currency activation, we are can also start building the Golden Deposit's on fund, with another very rare material's or possession's recognized in International practice of prestige. The Diamond Currency have established base on price in International Ratification, and therefore in prevention on monopoly decentralization of Diamond Price, is available build true advanced system's which can growth value of Certified Diamond's in level's of most rare material on Earth. Expansion price of Diamond's is strategical reserve for all states in risk on their decentralization or bankrupt, because activation of Mega Diamond Synthetic Industry is today very easy process and meanly in political economy, available for all level of state in any circumstance include global apocalypse. Therefore, The Diamond's is true Rare Material for security of future of every country in the world. "Today You are support me, tomorrow You have better trust for Your future State security guarantee". Common Support is one of most natural and first purpose of origin on principle of trade. The ID's government is institution responsible developed in Law, and The International Advocacy Intelligence Council (The ID's IAIC) is open proof for guarantee. The IAIC is institution of Lawyer's Office, activated as Social Unity of Lawyer's and Lawyer's Agencies in the World, in purpose to registry the Provisory Office of ID's Government under Geneva Convention's, External Representative Office, or build the Commercial Agency which can activate own Prosecution Office between all IAIC center's across the World, in strategy to activate mutual logistic of ID's State Administration, build jurisdiction of country, manage development and administration of business companies, build recruitment action between business people in the world, develop culture and religion partnership with event's, together primary Represent the Diplomacy of ID's Country in International Level's. Today, the IAIC institution can give Office work for 150,000 lawyer's across the world, in strategy to administrate The ID's Provisory Authority. World Policy Geography is build by the sovereign government's of countries where the ID's Government have own equal base in statute, and the Indigenous Nation's with de facto recognization or exiled movement's have standardized globally activated center's of communities recognized as Representative Office in foreign countries, under such purpose of world standardization it's not originated the vision of responsible determination for a blockade agains't function or activation of The ID's International Advocacy Intelligence Council anywhere in the world between legal countries. Our country is active under terrorist neo-colonization, with crimes of extraterritorial crime rule and criminal prosecution's, apartheid and threaten of assassination, threaten on destruction of our countries and state network's for business development, and therefore we are need stabilize our Military Power, together strategically use standard Commercial Protection for our Policies, Offices, and active Trader's connected with our country, and for it we are want build The ID's Global Security Concern of Private Companies Inc. institution with legalized code in International Law purpose, without violation of the Geneva Convention's, when also the ID's GSCPC Inc., Central Code of Institution is term's of strategical institution for International Security and Industrial Expansion of States, better guarantee for reserve protection of Your countries during extraordinary dispute, for Your government is strategical support the ID's GSCPC activation, and process of activation is only contracting Your national Private Security and Military Companies with Private Detective Offices, for building the GSCPC Inc institution by activation of The ID's GSCPC Central Code of Intelligence, in partner cooperation with Your Government Authority. The ID's GSCPC Inc., Central Code of Institution allow, for Private Companies connect together in the General Council of Institution, where the Council is under supervisory observe all activities available by The UN General Secretary, with state Observer from country where the ID's GSCPC Inc. have contracted any of activities, and also ID's Represent of Government. The General Council of Institution administrate their Security Personell's under Code of Conduct and International Law, together Commercial Rule and Legal Business Purpose, the goal is protect civil zones, civilist's, trader's, and fight agains't terrorist organization's or control the investigation processes of private disputes, or also train Private Agent's for Military Response in interest to fight under the code of States Military Jurisdiction, available recognized as The Foreign Legion of Country. The ID's GSCPC Inc. have a right activate in the ID's DONEABT country, own industrial network's and trade institution's, Bank of Institution, and also build the specialized facilities in relation on Hospital Center's, Training Center's, Private Prison's, or establish neutral and peaceful corporate center's in Outer Space. The ID's GSCPC Inc. is strategical institution for International Peacekeeping Mission, protection of people in special conflict's and disputes, when the contract's of Private Companies is pay from the economy of the Institution, and Your states haven't importance on need's for the financial share. The Institution give strategical protection for Your government and state also in most critical situation's. The ID's GSCPC is subject of legal institution which have a right to build own diplomacy relation's, partnership and strategical trades in open level, together with recruitment of new Private Companies for cooperation. According World Geography, The Institution can represent 2,500,000 private soldier's and more than 10,000,000 soldier's in Naval War time, standardly more than 10,000,000 Private Security Agent's, more than 10,000,000 Private Detectives, also advanced number of Spy Service Personell's, available more than 10,000,000 Worker's, and together advanced network of Business Companies. The ID's GSCPC Inc. have open first contract's in relation for own development building and activation, together International Protection and with opportunity use in Strategical International Interest's of World Democracy between the Government's countries, and together in ability pf International Law. The ID's GSCPC Contract N.°: 00, can in cooperation with Private Detectives, according the Jurisdiction of States, globally investigate the criminal networks agains't the ID's state, by activation of the partnership between Private Detective Offices around the world. The ID's GSCPC Inc. Contract N.°: 12, give opportunity for every government with interest in the membership of The World Diamond International Alliance, opportunity activate The WDIA in Outer Space by the service of the ID's GSCPC Inc. The Service is payed by the Institution, and need is only connect the strategical trade partnership between the states. In opportunity of organized cooperation, the Institution can between more than 20 day's activate first Space Center's for International Interest's. The ID's GSCPC Contract N.°: 03 & 04, is designed for strategical partnership between the government's of countries, according The Geneva Convention's Right on Distribution of Soldier's, in strategy to globally unite in region of hostilities and conflict activity, therefore we are have an opportunity for urgent consolidation of world armies in one power, when therefore we can protect the state under occupation from belligerent enemy. The Contract N.°: 03 & 04 with ID's GSCPC opportunity in own growth of economy of institution, can build our power of 100,000,000 soldiers which protect security of our partnership and stability of state agains't the danger. In time of World War II., the states must long time build global military alliance for defense agains't Adolf Hitler regime, bud today we are need only preliminary sign one contract which centralize global military power's and destruct the enemy in a time of few hour's or day's. This is true, much effective step for permanent world peace peace, than establishment of The United Nation's organization. The ID's GSCPC Contract N.°: 02, 05 & 06, is system of process for The GSCPC institution stabilization in affair of own corporate business network's and economy activities, in structure of The ID's state and legally on International Level, after development process of contract is effect with strategy which give opportunity for every states or client's, build the system of state contract for strategical protection under only valuable exchange in organized trade without full value payment, which give for Your state new strategical opportunity of business, and organized trade as partner economy which also strength the military power and modernity of Your country which again guarantee for Your national security growth. The ID's GSCPC Contract N.°: 07, is contract on distribution of the Prison Worker's, the contract which give opportunity build organized partnership in strategical process on the activation of our states common industries and trade partnership. Each time is strategical open and support building new trade region, when for Your country the price of Prisoner Worker's is true most ideal given value as investment for new regional business activation. The ID's GSCPC Contract N.°: 08, is opportunity for Your own policy great help in support stabilization of The ID's Federation, our ID's Federation recognize a right of Independent Communities and Self-Ordered societies or Organization's of people, to join the ID's Federation as Micro State which can start as Movement and use Federation partnership and re-connection between people in their strategy of development of the state under federal statute in ID's territories or civilized available zones, therefore, Your support of peaceful recruitment of movements around the world is mostly welcome, and Your Diplomacy and Recruitment Office obtain finance for recruitment service, as finance which can increase and legally origin under universal principles of UN Charter as the UN Trusteeship support for Authorities centralization, Social and Economy growth between people of New Federalizing Movement, opportunity for their administration and support on business building have immediately effect on financial increasement which in autonomy pay Your Diplomacy Service. The ID's GSCPC Contract N.°: 09, is a contract on recruitment only for business affair as act on the Private Diplomacy Service, for cooperative development between Most World Business People and Companies around the world, the act can have importance in ID's Stabilization and activation of ID's GSCPC, also mutual business building between our states and increasement on our strategical trade capacity with external geographies partner's, as bilateral and multilateral partnership in organized cooperation by trades of our states. In a time, when our government is under criminal blockade, our emergence hospitality is in absolute dis-function state, and therefore on relation in The GSCPC Inc., is our strategy build special Hospital Facilities in level of multinational conglomeration which can support stabilization of the ID's emergence system's and also build better emergence system's and opportunities for our partner countries. The ID's GSCPC Hospital Facility is absolute innocent subject, which can give strategical protection for people in complicated policy situation, persecution and risk of death, and financially can facility by established from own management of contracted board of directors, by the Office of State Labour Administration of any country, or recruited group of the Medic's and Commercial Manager's, Medical Legal Companies and Institution's. When Your Government Country or State, support activation of The ID's GSCPC Hospital Facility in Your state, and available in International Network, than effective Your state obtain strategic partnership for building Your state Health Industry Network, qualities and service, with cooperation opportunity in development special Health Scientific project's (Conventional Research), which can eliminate more than 90% of health problem's in Your country, prevent death of people in natural consequence, stop a process of old ages, and protect people in most critical state of sickness. The ID's government have active interest's protect world peace and security, protect the states during conflict, and also our current policy geography represent a conflict in terrorist blockade on our development and therefore we are need build system's of Neutral Security Power which can protect our development during risk of intervention by criminal enemy. For it, we are represent, The ID's Peacekeeping Robotic Security Industries, it is ID's DONEABT center as Corporate Industrial Network for production of the robotic security technologies which is used and administrate as International Heritage of World Peace, and Peace Power for protection of states in face of belligerent intervention, criminal occupation and terrorism. The Robotic industry is easy found, meanly under trade management of business companies, support for increasement of the trade network in ID's country bud meanly protection and cooperation in development of ID's trade companies as corporate branch in foreign countries, the source which build the International Peacekeeping Robotic Security industry in my country. The Peacekeeping center can next build, own raw center's, Artificial Intelligence Center's, automatized industries, the center's of scientific laboratories, metallurgy center's, advanced industry of technologies, and stable production ability is around 1,000,000's of automated robotic soldier's per one day, therefore ideal capacity for confirm permanent protection of world peace and security. The ID's Government is constitutional system in representation for Federalization purpose of state divident system, on Central Territories of Federation, and The States of Federation in one alliance membership. The ID's DONEABT is territory under central federal statute, as zone of unity between every federal states in federation. Today, in interest of unity between all nation's around the world under process of peace diplomacy and friendship between government's, we are start in mutually strategical partnership of development between the Independence Societies and Self-Ordered Organization's, as purpose on recruitment the people around the world, prevent their radicalization risk and convert their independence interest for Parliamentary participation in Your country as strategy on promotion of the federalization between our states as active much better strategy before their interest of Independence, and the system prevent on risk of Your territorial separation which create the effect of Your national decentralization, because in case of Parliamentary and National Victory of Your today separatist opposition, is effect in only progress of territorial expansion and new unity, which in effect on global infrastructure of self-ordered societies in thousand's of movement's, can give for Your country opportunity, in flexible period connect in unity between more than 100 government's across the world. Stand in millennial expansion is better than lose part of own national territories and lose power of state. The Self Ordered Societies, have together right, before their success of recruitment Your government for our federal unity, opportunity to build their organized movement in our country under rule of Peace Guarantee, and therefore expand in level of true new nation with control-ship of their civilized level equal as ID's Federal countries. The ID's Global Independent People Federalization is opportunity for activate the national function of ID's Federation, together with process to stop Independence movement's of states, and also prevent the radicalization of Independence people. The progress of project meaning step for world peace and building unity between the nation's, during The One World vision which can also meaning for Your government special opportunity in counter-expansion inside foreign state, as distributor of Your own ethnic values, people in share on Your National History, Cultures, Religion and also community interest, we are The ID's Federation Welcome every Peaceful and in Law Responsible Active People Organization's, Your support for recruitment of Self-Ordered people is very valuable interesting and we want true allow opportunity to benefit on our recruitment cooperation, Your recruitment service is process on profit for Diplomacy Representation, and also together establishment of new civilized subject of organization which connect partner bilateral trade cooperation with Your country and increase trade relation of Your state. Again, in relation on the GSCPC Inc., the GIPF people can in provisory time activate, and work for The ID's GSCPC Inc., active as International Peace Force, under institution Autonomy of economy, which provide opportunity to protect International security without need of payment from any of Your own financial authority and International Organization. We are also Welcome, The ID's GIPF, we welcome The Kanak Socialist National Liberation Front and The National Hostosian Movement for the Independence of Puerto Rico, together with all independent communities across the world, our strategy is to develop the Office which can create new form of Prosecution between all movement's around the world, and our opportunity of centralization can give for Your People and Representation, a level of Government Activities, control-ship of State Economies with open space for Your Corporate Development, building of Your State Office and connect in diplomacy level with our opportunity candidate for membership in The United Nation's Organization, World Trade Organization, and more than 100 Supranational Organization's around the world. The ID's Government as state decentralized by the criminal violence of terrorist organization and non-conventional blockades on our state development, we are represent the Application for Stabilizatory Membership in The Unrepresented Nation's and People Organization (UNPO), is UN sub-organization activated for The New Independence States under the UN General Assembly Covenant's, or the states in effect on decentralization during catastrophe or crime influence as occupation, and our state statute allow our membership in the UNPO institution which can again better re-connect us with The UN Organization and together establish a process of development in stable integration in International system's which allow our legal growth with minimal complication's and faster process for membership in Thr United Nation's Organization. Our application is written, send, bud in our time of blockade on all financial source we are haven't opportunity applicate in codes of the UNPO. Our need is connect the financial system's which provide us opportunity for payment of the registration taxes, and administrate our office which can stable interact, we are is true Thankfully for Your support in our ability to connect Legal Financial system's equally as The State. The ID's Federation as state of Federation developed for unification of all states and countries around the world, our major development plan have origin in process for partnership between Government's and construct Global Coalition of Parliament Political Parties for The One World project, is open cooperation for every Parliament Political Party for building opportunity of our states unification in fast progress, flexible at hundred of countries for one unity of countries and building one most bigger state in history of mankind, across all continrnt's, with own intelligence for absolute unification of Mankind. In a time of our dispute agains't terrorist organization, we are is interested build the peaceful settlement of dispute, bud our criminal opposition blockade all opportunity of peace development and cooperation with government countries, supranational organization's, and therefore our important need is activate the strp's of defense by the Internationally Organized Diplomacy which can in effect ruin Crime-Imperialist Mandates between states in the world, and our progress is much stable and faster, we are have open for global cooperation. The ID's Global Parliamentary Conference, is process of World Parliamentary Coalition of Parties who are can together cooperate for process of world people in peace unification, and also develop the world policy ideologies and move of nation's in the same purpose meaning as The NAM Bangdui principles, we are promote counter expansion of The Non-Aligned Movement interest's across the world. For strategy in trust on stable education growth of our people, We are also need activate the universal education program's which protect education development growth for our people. Our project is establish many of National and International Universities, bud for the original start we are can activate The ID's International University consolidated from all available Universities of the world, as the joint venture branch in level of own ID's Head Quarter, and therefore a common profit of all participated Universities in representation of one new ID's University Institution which can growth business on International education of own client's between ID's and foreign countries. The ID's International University can consolidate in joint-venture all universities around the world together with a process on strategy in development of new education network's in all states, support progress in education of countries and also again increase on profits of our members University and Education Institution's parties. The world education advancement is expand in major level, mean dominant part's of our world population is literate, bud stable is life true, the mean progress in education is experience. The ID's government therefore allow for Universities, connect The ID's Provisory Office in The ID's Universal Education Project as International program for Universities in character of Political and Economy, Management and Development School's, in strategy to use ID's Government Development process according universal step's corrected in Legal International Mechanism, as direct experience education for all student's in school, and together intellectually in one Parliamentary Assembly the Student's can design and partially build the Civilization system and International relation of ID's Government with active diplomacy representation, economy planning and cooperate in simulation of High Policy Level during preliminary organization by the Council of Universities. The Universities support design of development project's, use legal service of society for project's activation, and allow for their own student's mutually test the Practice of their education subject in real level of experience. The Student's can obtain real practice which growth their qualities and therefore strength the strategical power of Your national generation. We are Welcome all Partner Universities ! Our government country is partially developed in purpose of Internationally open institution, because the process of ID's origin have principles in policy of globalization, and we are therefore develop the program's of Global People Intelligence Centralization, a project have open opportunity in public cooperation of every institution in the world, and building multi structural categoric intelligence system's of institution's which can in one effectivity establish natural effect of State Self-Administration under organized purpose originated from responsible management of connected intelligence source. Our government have understanding in the policy natural principles and The Rule of Law, The Response of Mandate and multi formalized system's of policies in world regional difference, our strategy is build power in every available peaceful source and than therefore we are Welcome The Families of Nobility, the people who are have centuries of life practice in policy science, occidental policy and policy with high ethics level with response on family ordered codes, the people of Nobility can have special right in our country, and we are is glad for Your support in distribution of our data for people of Noble Genus, and with opportunity on strategical protection of applicant's for their ability connect, and consulate, cooperate and intelligence build, also in good being represent our partnership and diplomacy development with Your government country, the Noble people can join The ID's Office, and support building of state, or participate in policy question's if their member's of families want join the ID's cooperative partnership. All states in the world have own religion, believe and cultures. The ID's government is policy institution which originated in purpose of policy intelligence for Unification of the World, and therefore we are accept all Cultural and Religion movement's of The World, one of our mean strategy is to build the partnership with Religion Communities across the world, and we are therefore invite All World Religion Institution's, as our opportunity on world people centralization, in peaceful community co-existence on multi national level's and with strategy to build national intelligence partnership for protection of The ID's State Peaceful development and prevention on criminalization. The ID's Government have also spiritually cultural meaning in rhythm of God and Religion Codes, our Government existence have origin in interaction on illumination and symbolical connection in the Stellar Position's in Universe which symbolize our Authenticity of State heritage around the planet's of determined location's in Universe, and also our culturally shared people in one symbolic connection. We are is therefore very Thankful for all Religion Communities, Christian's, Muslim's, People of Mormon, Jude people, Buddhist people and all people who are believe in God or Spiritual Science with true knowledge, We are Welcome Your support for International communication with data distribution, and with Your opportunity to join. The government in strategy on development of The State of Globalization, we are want build maximal intelligence which can administrate our country and build International relation's between the states and countries. For it, we are design The ID's Ministry of Globalization, is a project for Global cooperation between all Non-Governmental Organization's, The NGO's & INGO's, with effect of activation create system of global people interaction in level when no any criminal state want continue in crime or threaten of war. The NGO society alliance in global level have opportunity create the progress of people in advanced humanitarian level's, and in common power organize the event of development for humanitarian resources and management. The Ministry of Globalization centralize all NGO societies around the world, as strategy for active influence ability in every level of order and strategy on people protection, better world civilization building, global cultural share, representation of people activities and all form's of mankind. The Ministry of Globalization can have own source available for management of advanced progress in stabilization of The ID's Government, State and The Civilization. The ID's Ministries in a level of The Stabilization of Provisory Offices, have open on strategy for International Partnership in Culture and Entertainment, Sport Event's and Religion Cooperation, as Institution for centralization of World Popular Partnership under process of The ID's Ministry of Culture, Entertainment, Religion and Sport, is process which can better harmonize situation and build peaceful space in dispute, growth populist dependence of terrorist organization and prevent crime increasement, today under The Charter of United Nation's is The Ministry important for purpose of Peaceful Settlement of Dispute. The ID's Government is advanced subject of Intelligence with own management of the Ministries for intelligence of active state administration and development, every one Ministries is available activate in Provisory Term's between modern society and commercial institution's or NGO, also representative amd member policies of The Self-Ordered Organization's. The ID's Ministries, We are have open place for more than 80 Ministry Department's, and we are can also expand the power. One Ministry Department is available represent by 3 Minister's. The ID's Entertainment interest's continue with ID's Invitation for all World Professional Sport Leagues in strategy to build the ID's National Event's under The ID's Professional Sport League Alliance, which together can support City Urbanization, partner event between our countries, increasement of valuable investment properties of Your National Sport Team's and Leagues in our country, We Welcome Your support for expansion of Your National Sport Team's, and in effectivity of successful development, we have multi dimensional increasement which can also build successful development industries between our countries. When Your Country want permanently support ID's stabilization, if Your Government determine our partnership as true important or interested for geography strategy, and opportunity of our partner centralization in the ID's Diamond Oasis NEABT is currently active under risk or dis-function of organized agreement for mobilization, or active terrorist violence, than in our opportunity is frequently available agree in purpose of partnership on activation of flexible ID's Extraterritorial Community in Your countries, the community of people limited in term's of the Geneva Convention's in protocol which allow Provisory Authority Administration in Neutral Country, in similar purpose related to The Vienna Convention on Consulate in bilateral relation formalized as Employ of Service Intelligence provided by the people of state in the country. The Community can activate Intelligence of Office with own autonomy control system in cooperation with Your National Police, and Private Security or Detective Companies, cooperative in development meta-national management connected with Your State companies, for organizing their opportunity entry inside ID's country and therefore activate their own development of Institution Branch, Representative Office or Trade Management Partnership. The Extraterritorial community not meaning community of opposition propaganda agains't Your government, state sovereignty, interest for violation of Your national integrity and recruitment of Your national people for organizing rule of the colonialist regime. We are want synchronize the cooperation process in purpose on the Provisory Administration Office for development political intelligence with relation to our country ID's DONEABT. According my genuse of a birth place in country of Czechoslovakia as today under legal law and Czech state jurisdiction, the bankrupted government by self-determination of state on subject of terrorist organization by more than 21 year's developed crimes agains't world order's, The Geneva Convention's, than our ability of government's in the world is continue in legal law, and recognize according original true, because before a time of origin on first Four Chapter's of Geneva Convention's, and also in standard natural purpose of policy, I have claimed a duty of The States for recognization of Provisory Office of the State after occupation, decentralization or any purpose of state bankrupt as process which is connected with the War Rule or Conflict Purpose, today I am those who are is born in Czechoslovakia, in my birth time active as Czech citizen, with therefore a statute of Right for claim the Czech soil as my own country of origin because illegal exile is not given a right of citizenship deprivation, and than also I am with a right for claim statute of Provisory Office of State which therefore I have daily represented under purpose in The ID's Federation, in right with sovereign development, and representation of original Czech governorate bilateral and multilateral treaties, and in effect of Czech National Criminalization with 21 year support's of world crimes as Czech National Self-Determination for State Bankrupt and activity of Terrorist Organization in civilized level, therefore under legal law I am only one man who are can claim the legal statute of government and Provisory Authority. The UN Peaceful Settlement of Dispute is process which contain a right on the re-compensation of victim's, judicial procedures for the reparation, also execution's and law enforcement processes, therefore we are have also originated the claim's of new territorial possession validity in right to use our statute as De Jure Sovereign across executed possessed territories of European Terrorist Alliance states, related to territories recognized as The ID's Right on Sovereignty in The Clipperton Island, and un-habited oversea territories of "All Terrorist States", as execution on their property by determination their statute as terrorist organization, is together given a right for all states of the world, under The ID's Declaration of Provisory Statute, to represent the claim of The World Mutual Economic Zone administered under the Currency of Nation's and open trades between countries. The Clipperton Island's, France South Indian Ocean territories, also USA un-habited areas since 1998 and before. Your government country have opportunity to join very original mechanism of International Trades and Development. Our governmental dispute is active more time than 21 year's, with active crimes of our opposition as, infiltration of supranational mandates of prganization's, global monopoly, train child's for building bankrupt of world order including United Nation's, organized geography genocide of 400,000,000 people during national celebration pf terrorist reality show, the crimes in multi level on purpose in violation of all International Law with UN Charter, statistically worse crimes than World War II., and according real rule of United Nation's, no any people can recognize legal sovereignty of The States connected in European Terrorist Alliance, and therefore The World Diamond International Alliance, Organization for Stabilization is very strategical step for all of nations. The Provisory organization is available activate as The NGO or INGO, which in effect of our International interaction can therefore obtain open space for building the cooperation between our states and centralization in process of one function and development of our mutual territory of every state which accept the Common Sovereignty across the countries of The World Diamond IA. The Organization have currently ability support our centralization in two times. First time is Development in relation to the European Terrorist Territories as our claim on sovereignty, or we are together create a process of centralization in territories of Outer Space, where we are origin in zone of Terra Nulli, therefore without dispute, and again stronger power agains't any our criminal and opposition enemies. The ID's Government build project of The One World, a project for unification of mankind, and our mean strategy is use every available opportunity for partnership in development of unity between nation's. The ID's government therefore represent the system of cooperation between nation's, during our strategy with global trend for building the Outer Space Civilization base, our invitation is for every state to building our new civilization in Universe, The Common Bilateral Stellar Civilization, which can externally unite our states under mutual project of partnership between our policies, and our states have therefore open regional opportunity for private partnership and strategical development on civilization relation between our states. The ID's Federation is multi-dimensional subject of unity between the subject's of states. The states have different level's, different function, also area characteristic or policy connectivity. The ID's federation can represent more than 1,000 own state subject's, and together allow activation the states which have a base on the International Heritage of Mankind. The ID's Corporatocracy State is Autonomy state which can bring new opportunity for Your business companies, the Corporatocracy zone is controlled only by the Business Companies active in Corporate Country, and the owner of company have obtain a statute of Senator who are represent his state development idea in The Corporate Senate, and therefore the Senator's together develop their trade interest's in governmental level, controlled by the ID's Federation. The ID's Corporatocracy State is system of world trade centralization, where the Business Companies have direct connection between their enterprises and corporate offices, which create open opportunity for trader's to build business partnership and use one source of council of senator's as alliance which provide faster modernization also for Your own national trader's active in the ID's Corporatocracy State, and therefore Your government and state increase on economy which have much advanced modernity in International Values. Our growth of ID's Corporatocracy State is process for Your national modernization and development growth. We Welcome ! We are is Very Thankful for All Dear Excellent Policies of States and Supranational Organization's, Your daily support is for us true successful and important, We are true have interest in our cooperation with You are and Your Authorities, our interest is maintain only good being position and partnership in International Level, when in effect of our blockade in Office disfunction is our contact ability very small, and therefore we are is forced for silence in un-knowledge on Your support's, multi-dimensional code meaning, and interest of Your partnership, we are must lose strategical connection's and our opportunity of time is centralized only on mean Supranational Structures of World Geography or Populist Trend under World current event's. For this, we want choice the reason, and our goal is to support the partnership in extraordinary cooperation in alliance of Policy Leader's, the Alliance which protect career growth and discipline building for all Dear Excellence Policies who are have end their mandate in the time of our time dis-possibility during oppression from European terrorist regimes. The Alliance Club of Ex-Political Leader's, is my appologize for the dis-ability permanently interact for every one president and prime minister, ministers and political parties, I am available together meet at a time when our connection have stable freedom, and therefore also success, I am glad for Your support and also I want support Your countries, together originally You too. We are is true Thankful for Your active support which give us opportunity observe existence of World Rule and Law, International Mechanism's of Justice and World Policy Geography, which give us opportunity build the system of our advocacy, legal and conventional protection, also confirmation on our legality in public proof. Today, the mean situation of criminal blockade have origin into base of decentralization and blockade on institution connection of our government which decentralize existence of our state. The blockade is originated by European Terrorist Alliance as permanent act of crime without allowance to agree in rule of diplomacy, right of civilized nation's and under International Law, our mean importance for our protection and open connect between the nation's without blockades, is only in case of abduction from criminal zone and therefore liberalization by International cooperative partnership during diplomatic protection. The Abduction of me today day's, from criminal zone to the neutral country under anonym protection, is most faster step of liberalization and elimination of blockades, prevention on dominance of terrorist states, and open opportunity together agree in law for prosecution of all crimes of Terrorist Europe, as a process which give the justice for every of our nation. Opportunity for abduction me is true far as most easy, and many of states have such ability. One of opportunity for fast speed abduction me from Europe is when the state of supporter for liberalization, use own opportunity for production of The Vrill system technology as known technology from World War II., and today secretly used between many of government military regimes, the technology can deploy own Micro plasma shield agains't X-Ray Radar, with installed small Laser for elimination rockets or any impact weapon in distance of ten's or hundred's of meter's, the engine of Vrill can use a Speed of 1,000Km/h as health speed for human biology, a speed during sensitivity of gravity in difference of hemispheric lines allow growth and increase speed sustainable and during 8-10 minutes is available connect the zone of micro gravity around 500 kilometer's from ground up in the sky, a zone without Radar's, Rocket's of enemy, and together with open Orbital connection between every one state across the world. From orbital position of zero gravity is available travel every where around world per few seconds, and I am very Thankful for Liberalization. In case of technology construction for system of Autonomy pilot, the system can catch me in the city, from Orbital line to Ground in speed only of one second, because the vehicle haven't passenger who are have biology dependence on gravitation sensitivity. The process of abduction is only 5-10 minutes, faster than European Defense Interaction System's and also much faster than Police or Military Local station's. The crimes of Europe violate integrity of legal nation's, together impact a life of innocent civil population, and criminal states use innocent people as their symbol of crime during violation on their human right's. I am realy pleased for Your support in Prevention on Crime and Protect People in Europe and Czech, also partner states of ETA around the world, young people in risk of persecution for social believe or cultural statute in which they are is born. The Czech government, it is policies and people of extremist dirty perverted practices which they are in crime event nationally use for strategical modification of International policies and extremist threaten agains't function of International Legal Law. Prevention of slavery of people is strategical for world security, because under consequence of people traum's after violence, and in sociological effect on observation such level of dirty and perverted people as national movement, than true people of victim can have lon generation traumatized sugestion's for extreme processes of extermination anything what is in partnership with this subject of inhumane policies. No-Contact Complication, I am very glad for Your support on contact between us, today please Never lose time be writing me e-mail or any message on telephone, I am under terrorist blockade and never criminal states allow me any purpose of communication. Google E-Mail, Facebook, Instagram, Twitter, any another media is absolute regulated and censured, it is under criminal maintaince, and my opportunity of connection is only in private touch or physical messenger. Our contact need be, in touch contact, agreed point of contact connection on consulate or legally established center, available also with the messenger distributor in local zone of my position (foreign traveler on short time period of meeting), and really true most best connection purpose is, if the States of Non-Aligned Movement support establishment of The ID's UN Trust Agency according the UN Charter Article 55 & 59.